the streets of New York, darkness and violence reigned. Dimas Daylight Salaberrios popped his first pill when he was eleven years old, and just days later, he was selling drugs to his schoolmates. By fifteen, he was facing time at the notorious Rikers Island Prison. 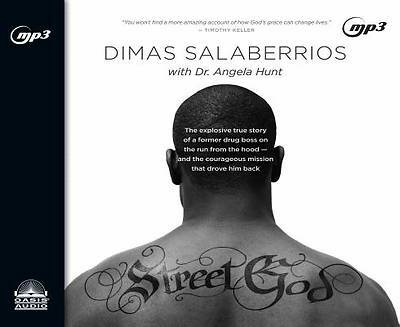 It was never safe to turn your back, and Dimas saw only one chance to survive: to become a street god. He would be the richest, most powerful ruler in the hood . . . or die trying.But in one terrifying moment, with a gun pointed at his head, Dimas had to decide: How far would he go? Was he finished taking reckless chances to rule as a god of the streets? Would he dare to entrust his life to the real God?an even riskier path? Because that God would send Dimas back down the darkest streets he d ever known on a rescue mission after those still in danger. "Street God"is the true story of one man s against-all-odds journey from the streets to the altar and back again. A modern-day"The Cross and the Switchblade"for a new generation, it reveals that we re never too far gone for God to change us?and shows how a single spark can illuminate even the darkest existence."